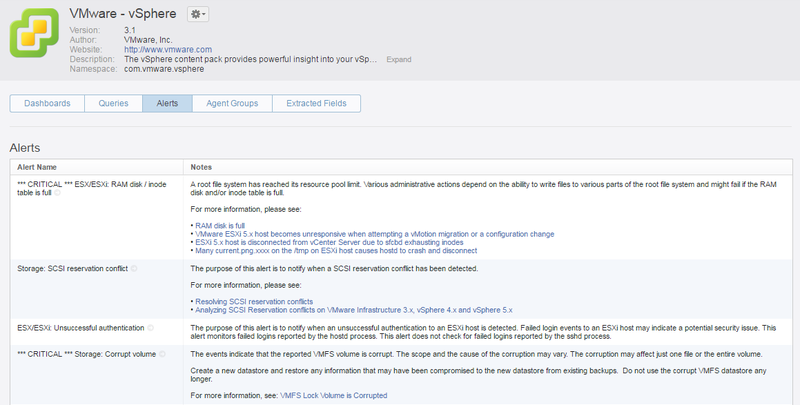 VMware gives away a 25-OSI pack of vRealize Log Insight 3.3 for all users with a supported vCenter Server license. 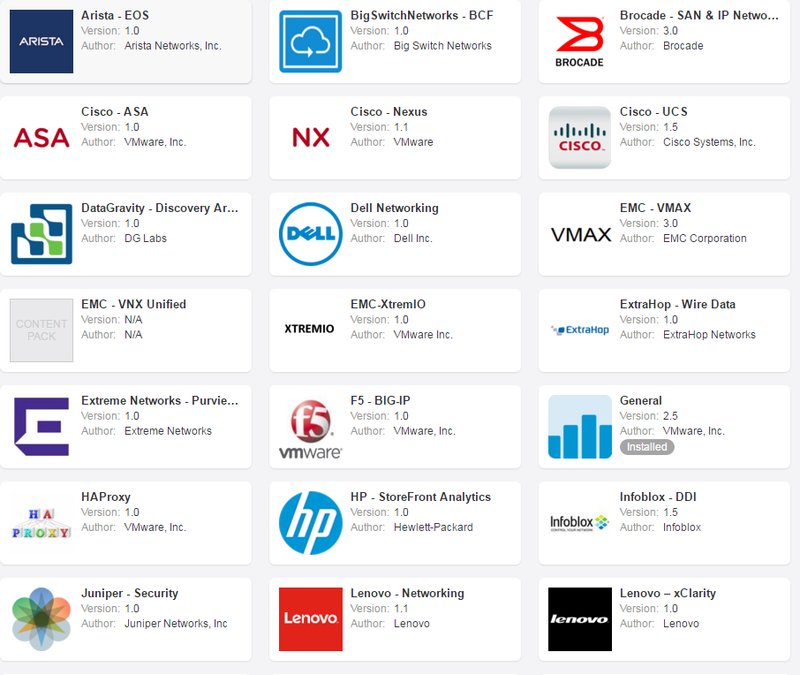 VMware vRealize Log Insight is a log management software with intuitive dashboards, sophisticated analytics and broad third-party extensibility. It provides deep operational visibility and faster troubleshooting. Log Insight is not a new product. I've already written about it during the beta phase and the final product was introduced back in 2013. With the release of vSphere 6.0 Update 2, VMware has included a 25-OSI package to all vCenter installations allowing all customers to use the product in small environments for free. In this post I am goging to explain how to obtain the 25-OSI pack and deploy Log Insight for vCenter. 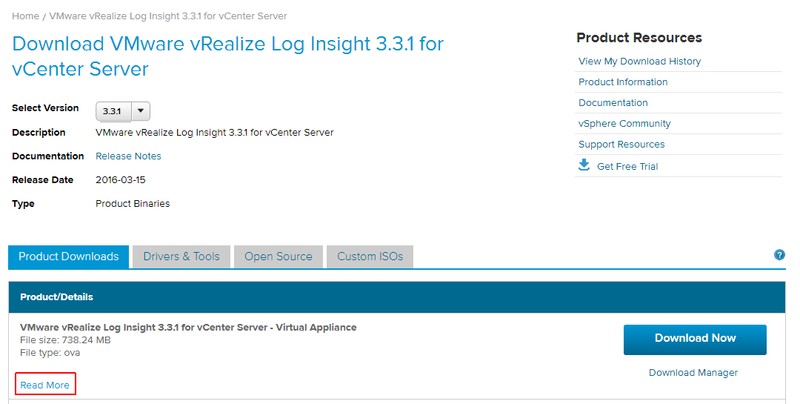 VMware vRealize Log Insight 3.3.1 for vCenter Server is available as virtual appliances. The download has been added to the vSphere 6.0 section, but there is no difference to the "VMware vRealize Log Insight 3.3.1" package, available in the vRealize section. The extra small configuration supports up to 20 ESXi hosts. To take full advantage of the 25-OSI package, and generally for production, the small configuration is recommended. The largest deployment supports up to 1500 ESXi hosts (15,000 events/second). There is no need to make a final decition here. The appliances can be extended later. Add a License key. You can either use your vCenter Server 6.0 License key, or the key provided at the Log Insight download page. Logfiles are now ready to be analysed. I've deployed 2 ESXi hosts with a vCenter Server, so there are still 22 free licenses left to add more ESXi hosts, or other systems. I'm installing the Linux Agent on a Debian based Ubuntu 14.04.4 LTS. The Agent needs to know the address of the Log Insight server. Any further configuration can then be done from the Log Insight Management console. 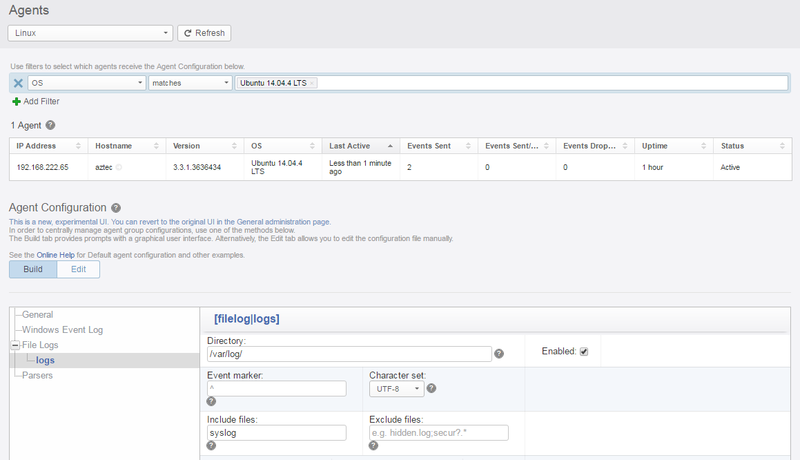 Edit the configuration file /etc/liagent.ini and set the hostname to your Log Insight server. The Linux host should now appear in the Agent Configuration. I've also added the Log Insight Server as Syslog server on my router. Very nice and quick solution for small networks. But what is the outstanding feature of VMware vSphere Log Insight? Content Packs! When I login to download 3.3.1 Log Insight from my company's account I donot see the license as you have shown, so I guess I should be taking to VMware Helpdesk about it? We have vCenter 5.5 in our environment. Why is this not available for Essentials Plus licensees?? Not sure but it works with my vCenter Essentials key. using this as syslog for your router did affect the number of OSI utilized? Is there a limit for storage / daily log amount? Yes, of course. Any "device" that is delivering to the appliance requires a license. If you add ESXi hosts, they are actually using the appliance as Syslog Server. In terms of licensing, there are no storage / daily log amount limitation. The license is available from the "Read More" link found beneath the File Type on left side of page. Final note: VMware Support stated to me that the License Key obtained via this method is Only "Valid for 60 days." Oddly, when installing the license key, it shows as a permanent license ... contrary to what VMware Support stated. I was almost to the stage of pulling my hair out, if I had any left, since the login http page would not come up on the appliance. Finally I walked away and took a coffee break. 20 minutes later when I came back I tried again and presto. Just a tip to be patient. "Free Log Insight for vCenter" cant use "3rd party content packs".... so the last part of the post is not useful. How to you add vCenter with port numner other than 443 ? Can we use Tags to pass a port number ? Are the content pack free too?